Fish, no matter what type it is has always been one of the most favorite items on the grill along with steaks, ribs and vegetables. For an outdoor grill, it would always be better with a few slices of salmon steak or sea bass. No matter how you cook, season or serve it, fish would always taste great on the grill most of the time. However, you should be aware that there are different cooking methods that are right for different type of fish. You can classify fish according to size, whether it is firm or not and whether it is fillet or whole. This is because not all types of fish would fit into a single grilling method; different approaches are for fish depending on how it is classified. So for you to learn more about fish and how exactly you should grill them, here are some tips and tricks. Virtually almost every meat, sausage, fish and vegetable would taste good on the grill granting that you know the right way of cooking it and other things concerning it. The most popular items would of course be steaks and other large cuts of meat on the grill, so popular that an outdoor grill session with the family is never complete without some slices of meat or a rack of ribs. These items, because of what they are can be called as the classics. These are best direct grilled, smoked or seared depending on what you want to produce. For better taste, you can also coat them with barbecue sauce of which would come in so many options. If you are used to the typical tomato based barbecue sauce, you have to unwind and get to know a lot more options that would taste equally as good. For barbecues nowadays, sauces can be made out of apples, strawberries, honey, mustard and virtually anything that goes well with grilled food. While most of us probably grew up with having outdoor grills every thanksgiving, Christmas, New Year and whatever occasion there is, we cannot deny that it brings us a lot of joy even if we would still do it up to now. However, there are many ways of which we could make grilling outdoors more enjoyable and the good thing about it is that you don?t really need an occasion to do it, all you would need is a grill and the company of some people. While the food produced by grilling is undeniably enjoyable, the memories we have with it are just as enjoyable as the food we get from the grill. Just think about the many memories most of us grew up with that we can associate easily to grilling outdoors. So to make your grilling experiences more memorable, here are some ways to enjoy grilling outdoors. Whether these are your friends, family or your special someone it is definitely more enjoyable to have outdoor grilling sessions with people whom you would like to spend quality time with just like how you used to do when celebrating occasions while growing up. Don?t wait for an occasion, just give your folks a call and invite them over for a barbecue. This gives you a good opportunity to bond with them as well as enjoy each others presence. Grilling has always given a lot of us gustatory pleasures with the magical flavors you can produce with it. While the basic grill would already allow you to do a lot of things, just imagine what more things you can do when you add accessories to your grill. A griddle for example would allow you to cook eggs, bacon and ham on the grill and it is much easier to pick them up or turn them with the use of tongs. 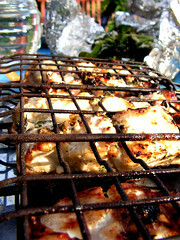 A grilling basket is also perfect for cooking whole fish and would make it taste much better. With these new innovations for grilling, you are sure to have more memorable moments on the grill with a whole lot of new things you can do. Everything from grilling itself to cleaning and preparing the grill is now much easier to do with the help of outdoor grilling accessories. So to give you some tips, here are some accessories you might want to know more about. While meat or poultry would never be out of anyone?s grilling vocabulary, everyone who is onto grilling should also have some dose of grilled seafood. Not only does seafood give a healthier option to those who cannot have too much of meat but they also taste really good if you know how to prepare them the right way. With the many pleasant things you can turn seafood into by the use of your grill; it is no wonder why it is getting more popular by the moment. Considering that, you might want to try having seafood the next time you and your family go grilling. So to educate you with what seafood would be great on the grill as well as what are some good things to do with them, here are some tips that would describe in detail the ideal way of cooking and having it. Depending on what you feel would suit you the best, what you will be cooking most of the time and how much you can actually afford are some of the vital factors you must consider when buying outdoor grills. You have to take note that different grill would have different features, would have its fortes and weaknesses and as well as would suit a place depending on where you plan to put it in. With the many options you have, you are sure to be delighted when choosing one. A grill is a reasonably large investment but if you have a backyard, you might as well consider it as a necessity. A good outdoor grill would put that moss gathering backyard of yours into a party or a barbecue place. So to help you come up with a grill that you need, you want or you have to get, here are some tips for you to get what you really need. When it comes to items on the grill or anything that the average American would think of when it comes to food, one of the most legendary items is the prime rib. Not only is prime rib one of the best cuts of beef there is around but it is also commonly associated with outdoor grilling we had as kids, restaurant dates and many other factors that would make it significant. So if you happen to be into grilling, you can make this more meaningful by grilling prime rib yourself. With the wonders that you can make out of it, you as well as everyone who will get a taste of grilled prime rib is sure to be delighted by it aroma, its taste and is sure to be very full after having a full serving. Meanwhile, here are some tips on how to grill prime rib. When it comes to outdoor grilling, even the idea of it would never be complete without some association to some nice cuts of prime rib, t-bone or other nice cuts. This is because the best way to have them is in an outdoor grill and that they taste so good, an outdoor barbecue with the family would never be complete without some of them on the grill. Meat on the grill has become so popular that it has been decided to brand it as a classic. It is so popular in fact; if you go to restaurants with grilled food any cuts of meat will never be out of the menu. The catch is it is quite fun and easy to prepare. Grilling meat is just like grilling any other item on the grill. The fun part is that it is not only limited to direct grilling but you can also do a lot of other methods such as smoking, roasting and searing it. With all that, it is no wonder that meat on the grill has become a classic. Before anything else, you should be aware that your outdoor grill is not limited only to direct grilling. Your outdoor grill can do so much more than just that, it could even be more versatile than your kitchen. While the classic method of direct grilling can already please most of us, just think about the other things that it could do. 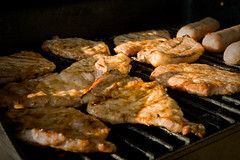 Other outdoor grilling techniques include searing, indirect grilling and smoking which turns ordinary meat into a tasting pleasure with a distinct flavor. Different outdoor grilling techniques are to be used depending on what types of items you are to grill, for example; direct grilling is best for large cuts of beef and sausages, smoking on the other hand is best for whole fish and meats too. With experience, you will later develop a taste of what goes where in the grill enabling you to be an expert on it. Along with meats, vegetables and poultry, fish is also one of the most popular items anyone can put in on top of the grill. This is because fish has a very pleasant flavor, is quite easy and fun to cook and would offer a healthier option than most other items that are usually grilled. However, there are different methods and approaches to cooking different sorts of fish. Following these methods correctly would make your fish taste much better than how it has always been. Take note that fish is to be classified into some categories when it comes to grilling and these are whole, fillet, firm and tender fish. These categories are what you should use as a basis to know how to cook it. So to further educate you with other guidelines you must follow when grilling fish, here are some helpful tips to guide you through.